Here are the directions for the Love note post it holder I made with my Cricut. I taught a small class at Scrappers Edge featuring this project! The first cartridge you need is Fabulous Finds. You will need to set your machine to cut at 2 ¼ inch with the pressure at high, and the blade depth set at 5 or 6 depending on the thickness of the cardstock. Set your cutting speed at medium. The design is called , it is on the bottom row and you will need to use the shift key to select it. Load your printed cardstock on the mat and begin cutting! (Use the chalk ink to distress the edges). Next you need to cut out the shadow. You will need to change the pressure setting to max and the blade depth to 6 because we are going to be using Bazzil cardstock. The rest of the settings will be the same. Press the shadow button on the right hand side of your keypad, then press the shift key, then select . Load the Bazzil paper and cut the shadow! Now its time to cut the transparency sheet. This can be tricky. I have found that the computer printable transparencies are more flexible and less brittle so they cut better. What has worked best for me is setting the machine at low speed, high pressure with the blade depth set at 6. Using a new sticky mat will also help! Change the size dial to 1 ¾ inch. Press the insert button (its above the shadow key) and press the shift button, then select . We are cutting the insert to the heart paper clip for the front of the note holder. Load the transparency and press cut. Unload the mat and power off your machine after this cut. Change the cartridge to Jasmine and then turn the machine back on. Reload the the mat with the transparency. Keep all of the same settings and cut out the “I love you” phrase. Use the love part of the phrase for the front of the note holder. (Use the alcohol ink to color the transparent cut outs). 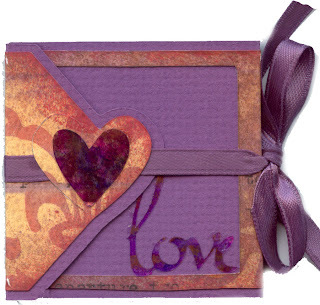 Thread the ribbon behind the heart on the printed cardstock cut out, then glue the printed cardstock to the Bazzil cardstock shadow using PVA. Score the note holder (when the glue is dry) and fold into shape. (The Cricut cuts tiny notches into the note cover to mark where the scoring should go). Glue the transparent heart onto the top heart shaped flap, and the transparent “love” off to the side so they are next to each other when the note holder is closed. Glue in a half stack of mini post-it notes, tie the ribbon and your done!! That love note post it holder is so cool!!! Can you post a picture with it open too? And congrats on the class! I'm guessing they understand what all those words mean in the instructions. All I know is it rocks! You rock! Baaaahh!!! You rock. You're the Cricuit Guru for sure! 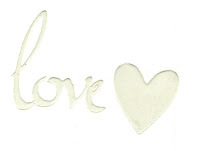 Thanks for the post on the love note post it holder which you made in the cricut. that loos really nice and the main thing you explain all the thing which are required for this.